CJ's Diner, voted Best Breakfast in Durango has been serving quality food to the local community for over 10 years. CJ's has a very cozy and friendly environment, one that makes you feel like family the instant you walk through their doors. They serve breakfast and lunch all day in huge portions that have patrons leaving full and satisfied. Breakfast Burritos, Skillets, Burgers, Sandwiches, Salads and Mexican food are just a few of the delicious items found on their large and affordable menu. 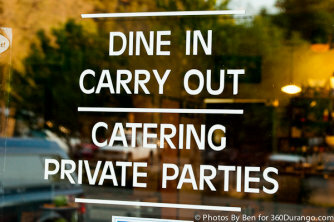 CJ's also offers catering and private parties. Whether it's a wedding, office meeting or a backyard bbq, CJ's can provide to all your catering needs. Owned by Jerry and Carrie Martinez who have 30 years of restaurant experience would love for you to come by and say hello and experience what friendly service and exceptional food is all about!